Jupiter retrograde 2019 begins on April 10 at 24° Sagittarius and ends on August 11 at 14° Sagittarius. Jupiter retrograde is a time of philosophical and spiritual introspection and reflection, involving growth, happiness and success. This year the main theme of Jupiter retrograde is romance and intimate relationships. However, Jupiter stationary retrograde on challenging fixed star in the Sting of the Scorpion can cause immorality and embarrassment. 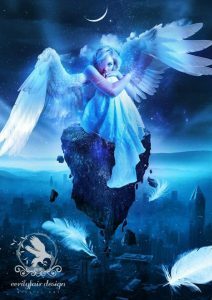 Some testing planetary aspects also bring the potential for jealousy, obsession and a variety of other excessive and destructive behaviors. Before more detail on Jupiter retrograde 2019 you will information about natal Jupiter retrograde followed by the general meaning of Jupiter retrograde in transit. Jupiter retrograde natal suggests there was a problem in achieving goodness of the soul in an earlier life. This certainly does not mean you have a bad soul, but that there will be some lessons or extra effort required this life to achieve goodness of the soul, to be genuinely happy and content. Jupiter retrograde shows the areas of life, or the personality traits and behaviors, which specifically need extra development. The optimum Jupiter nature is broad-minded, happy, comfortable and content. A healthy Jupiter is continually growing and expanding in philosophical and spiritual outlook. The aim is to be charitable, generous, friendly and welcoming to all people, regardless of social status, religion, cultural or ethnic background. Natal Jupiter retrograde could show as greed, selfishness, gluttony, extravagance, wastefulness or self-righteousness. Addiction, intolerance, bigotry, ignorance or showing off might be holding you back. Whatever is stunting your personal and spiritual growth is what Jupiter retrograde focuses on. This could well have been an ongoing problem hindering success over many incarnations. Events or relationships will keep reinforcing the problem area this life, especially during Jupiter retrograde phases. Jupiter retrograde transit is a regular cycle occurring every 13 months and lasting for about 4 months. Transiting Jupiter retrograde is a time of philosophical or spiritual introspection and reflection. You could have to deal with particular issues involving growth and development, happiness and success. Jupiter retrograde means that whatever area of growth you need to work on is so important, extra time is needed to take stock and make sure everything in order before you continue. You may be tested to make sure you are ready to receive the good fortune, new romance, or increased wealth you seek. Perhaps a destructive behavior like greed or addiction is out of control. In this case, Jupiter retrograde will offer a chance to recognize and admit the problem. Things may get so out of control that an intervention or some drastic event must occur to shake you out of your complacency or ignorance. Once Jupiter stations direct you should have come to terms with the relevant issues and be ready to leap ahead toward success and happiness. Jupiter stations retrograde on April 10, 2019 at 24°21′ Sagittarius on a challenging fixed star and in challenging T-Square aspect pattern to the Moon and Mercury. Fixed star Lesath at 24°16′ Sagittarius in the Sting of the Scorpion gives danger, desperation, immorality and malevolence, and is connected with acid poisons, accidents, catastrophes, and operations. But with Jupiter it “can make for marked achievements.”  It also gives a probing, sharp intellect and incisive wit with an enterprising spirit of keenness of insight. Moon square Mercury can bring disagreement because of parochialism or moodiness. You may feel very opinionated on a particular subject and care little what others think. Emotional biases can influence your thinking, and your intellectual reasoning can influence how your feel about a person or subject. Try to take a critical look at both sides as you perfect your ideas. Mercury square Jupiter brings a broad and optimistic outlook. But a lack of concentration or inability to focus on the smaller details may lead to errors of judgement and mistakes. Overconfidence is possible and could be seen as arrogance or even bigotry. Don’t promise too much or over-estimate your abilities when making plans for the future. Moon opposite Jupiter brings good feelings and generosity but also lack self-control and gullibility. If you are too trusting and kind you could be taken advantage of. Your generosity might be seen as a weakness by others. Being less guarded about your feelings can be an open invitation to interfering mothers or moral crusaders. Obsessions and jealousy are possible. Concerns about your future or questioning of your belief system could make you feel emotionally upset and trigger excessive behaviors such as over eating and substance abuse. Asteroid Juno conjunct Moon makes romance a major focus of Jupiter retrograde 2019. Juno rules women of childbearing age, soul mates, true love and commitment. Demetra George says Juno symbolizes the mystical union, or state of spiritual consciousness you can reach when you transcend your ego. Overcoming separateness through union and becoming one with the universe. But the challenging star and aspects suggest true love will be tested by selfishness, arrogance, intolerance, jealousy, infidelity or disloyalty. 1. Create your chart HERE. 2. Choose “Extended Chart Selection”. 3. In “Additional objects”, select Juno. Venus conjunct Neptune reinforces the romantic theme of Jupiter retrograde 2019. It brings new love or more compassion and spiritual bonding to an existing relationship. But disappointment is possible if you have not been accepting the harsh realities of a negative relationship. 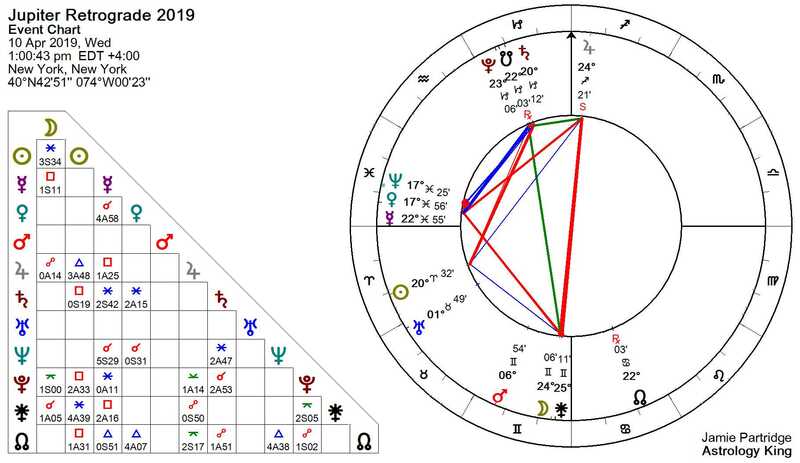 Jupiter square Neptune on June 16 stays within 2° orb all of June 2019 so it is important for Jupiter retrograde 2019. It can test your faith due to an embarrassment or disappointment. You may have been too trusting or over idealized a romantic interest. Avoid being too optimistic. You may feel trusting and generous but the risk of delusion and deception is too great to risk your resources. Also avoid gambling, drugs, gurus, cults and get-rich-quick schemes. Rely on the advice of trusted friends and family. 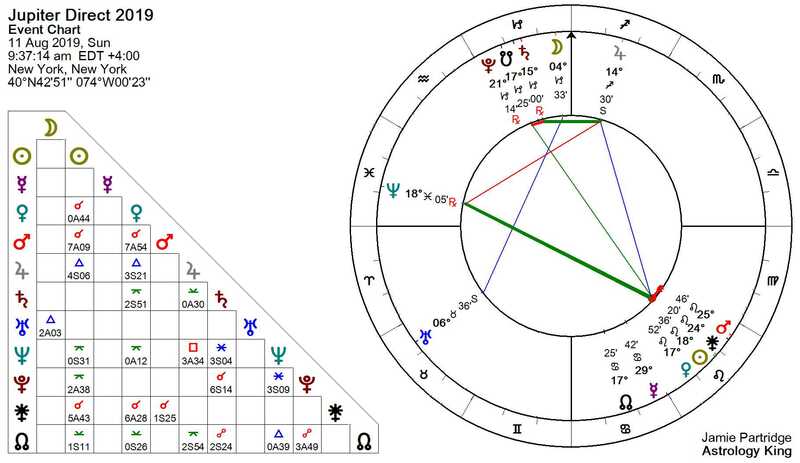 Jupiter stations direct on August 11, 2019 at 14°30′ Sagittarius (see chart). Fixed Stars and Their Interpretation, Elsbeth Ebertin, 1971, p.69. The Living Stars, Dr. Eric Morse, 1988, p.85. Asteroid Goddesses, Demetra George & Douglas Bloch, 2003, p. 158. What Secret Will April Reveal to Us? Next post: How to Redesign Yourself From the Cellular Level and Beyond!